GitHub - RicoSuter/NSwag: The Swagger/OpenAPI toolchain for .NET, Web API and TypeScript. Want to be notified of new releases in RicoSuter/NSwag? The project combines the functionality of Swashbuckle (Swagger generation) and AutoRest (client generation) in one toolchain. This way a lot of incompatibilites can be avoided and features which are not well described by the Swagger specification or JSON Schema are better supported (e.g. inheritance, enum and reference handling). 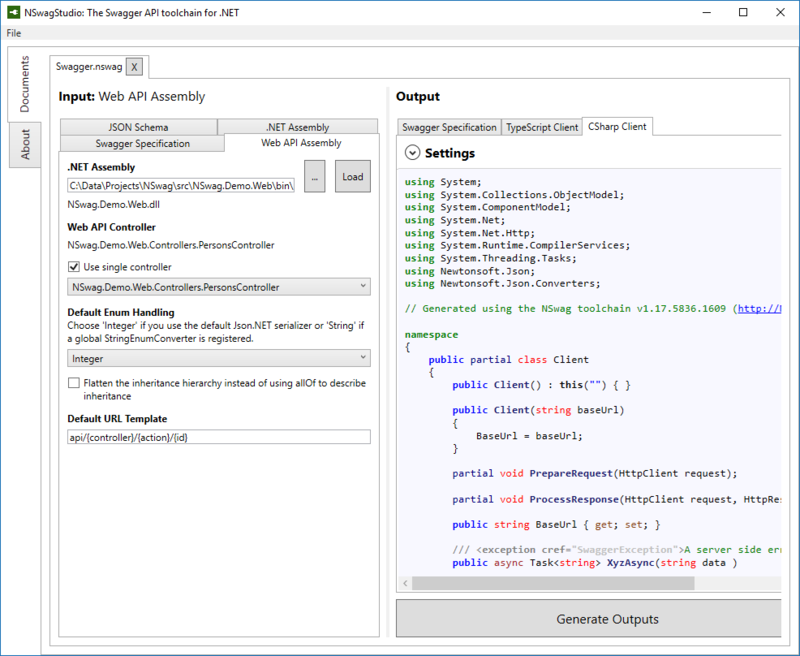 The NSwag project heavily uses NJsonSchema for .NET for JSON Schema handling and C#/TypeScript class/interface generation. Check out the project Wiki for more information. Please contact Rico Suter for paid consulting and support.